View stories and articles on weddings, brides, dresses and everything else that has to do with planning the biggest day of your life. White Weekend SALE and Happy Thanksgiving!! On this Thanksgiving Day , the entire TBP team would like to give thanks to all of you for making TBP become what it is today . We have been able to grow and become a better Bridal Boutique and wedding planning agency thanks to all your constant support and collaboration. We are constantly trying to improve our services and include the most exclusive selections of non-traditional Bridal gowns from our Top designers such as Anna Campbell, Carol Hannah, YolanCris and Julie Vino! We are also expanding our services to give our brides the entire bridal experience ranging from wedding planning services, beauty ,wellness and whatever the bride desires! To celebrate this Thanksgiving day and and show our greatest appreciation for your love and support we would like to invite all of our Miami Brides to our White Weekend Sale event Nov. 23 to Nov 25. This event features a 10% discount on our entire bridal dress collection. We have an amazing selection of dresses for the modern bride including vintage and bohemian style dresses. Book your appointment here and enjoy some happy bubbles !! 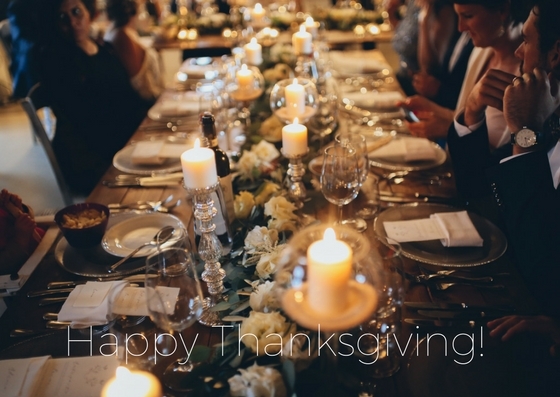 Happy thanksgiving to all and we wish you a joyful day with friends and family!